If I hear one more chef telling us how to cook sprouts I think I will scream – (I am similarly sick to death of them going on about how their recipe is ‘lush’ or, heaven forfend, ‘well lush’). If you don’t like sprouts then don’t buy them! If you have to cover them in bacon, chestnuts, goose fat, butter and who knows what else so you can’t taste the poor little things then buy some carrots and have something you like! I am probably weird in quite liking the poor little green buttons but I won’t go on. Instead, I will extol the virtues of sprouting seeds. I have written more often about these little beauties than I care to remember but I think they are brilliant. As to their nutritional virtues, you can look elsewhere and believe what you want, but basically they are bursting with goodness and it must be good to eat absolutely fresh, young veg. What is so great about them is that they are cheap, fresh, easy, can be grown on the windowsill and they taste good. As Christmas day approaches I seem to crave salads and simple food and so I cranked up my seed sprouter and now have some ready to eat and I feel great munching on them. There are lots of seed you can sprout but some work better than others. 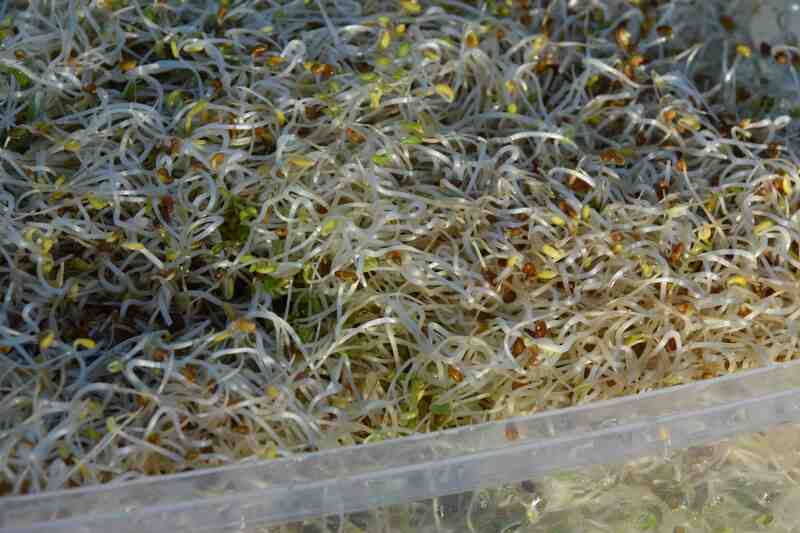 I only regularly sprout three kinds because they are a) cheap, b) I like the taste and c) they are easy and reliable. These are alfalfa, lentils and chickpeas. I have a three-tiered sprouter which I use for alfalfa and I use jars or plastic tubs for the lentils and chickpeas. Before you start, and you can sprout them in light or dark, at room temperature, you must be prepared to rinse them regularly – at least twice a day – the more the better. These three take 4-5 days to be ready and after that you can ‘hold’ them in the fridge for another few days without any problems. In most cases they should be eaten when small because they tend to get bitter as they get older. Alfalfa is my favourite and the sprouts (top of page) taste of peas. 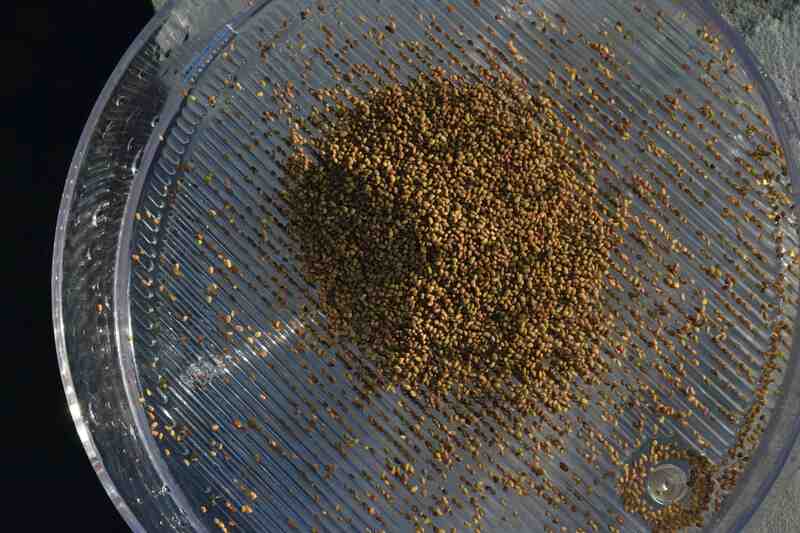 It is quick and easy but the seeds are small and you do end up with a sink spotted with sprouts and seed husks. But they are worth the effort and they are easy to eat, whether in salads or scattered in a sandwich. 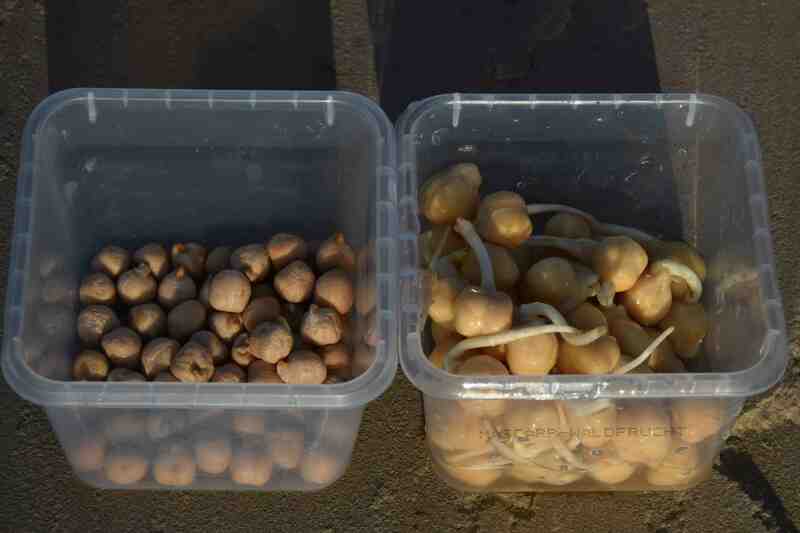 Photo above is how they look on day 1, top photo is day 5 – ready to eat. They go from small with white roots to ready to past it in just a couple of days. I rinse them when ready and put them in plastic tubs in the fridge and make sure the next lot are on their way. And prepare to be surprised at how small a quantity of seeds makes a big handful of sprouts. If you don’t have a sprouter use a jar with a piece of cloth ‘rubber-banded’ over the top. Rinse and drain twice a day. You will find the seeds stocked by all major seed companies. The biggest surprise when I was experimenting, was how good chick peas are. They also taste of peas. They are the easiest to grow because they are big and you can rinse them and strain out the water with your fingers and then put the lid back on the jar. It is worth soaking them for 12 hours at the start and then rinse and drain them. They are ready when the roots are 1cm long. Leave them longer and they become bitter. They are nice enough to eat as they are as snacks. They are cheap to grow – just buy a pack of dried chick peas from the supermarket. The third good sprout is lentils. Again these are cheap because you can buy a pack of green or puy lentils from the supermarket. Again they are best soaked for 12 hours and then rinsed and strained. Then rinse twice a day. Do not use orange, split lentils or split peas. Ready after about 4 days they have a slightly peppery taste. * Some people have problems eating raw pulses so be a bit cautious before eating large amounts of chick peas or lentils if you get indigestion eating raw peas or beans.